Last Friday night, I went to dinner with my husband. After a long workweek, I was looking forward to sitting down to a burger and a beer. As we bellied up to a table, a wave of disappointment came over me as I looked at the beer menu. The restaurant had 102 beers on tap. One hundred and two choices. How was I ever going to decide? And how did I know if I was going to like what I chose? Lucky for me our server was a true expert when it came to all the beers they carried. He asked specific questions about my preferences, likes and dislikes and narrowed the 102 choices down to three or four he thought I would like. Within a few minutes, he took a very overwhelming situation and turned it into a great experience. I see this phenomenon occurring not only in my personal life but professional life as well. Architects and designers are inundated with sales reps offering multiple options for everything from concrete to ceiling tiles to fabrics. It’s no wonder that by the time they get to the storage room they stick some static shelving in the corner and call it a day. Unfortunately, that’s often not in the best interest of the customer. When it comes to labs, we don’t just offer powder coated steel casework, but wood, laminate and stainless steel as well. If an equipment planner is working on storage for a hospital procedure room and the customer wants steel cabinets on casters in one room and built in laminate cabinets in another room we can provide both of those options without issue. 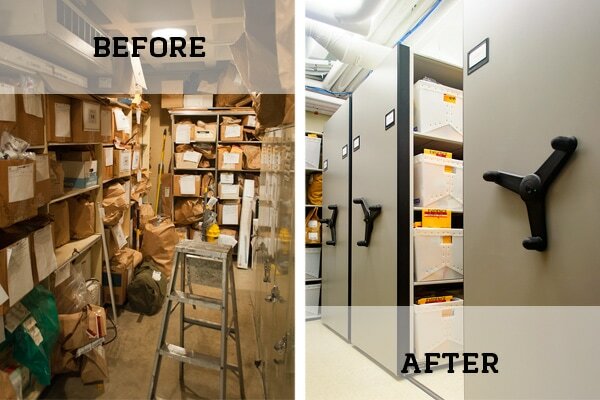 In the public safety market, we often get situations where police stations can’t accommodate a pass-thru evidence locker but they still desire the chain of custody and security that solution provides. The good news is that multiple versions of the locker exist to fit any new or renovated space. File storage may not be as popular as it once was, but it still exists in many markets we cover. Ideally, we’d love for all of our customers to maximize their file storage with high density mobile, but sometimes process, space and budget don’t allow for the investment. Rotary cabinets, bi-files and static shelving may not be quite as efficient, but they are all viable options when space is at a premium. However, there can be a downside to offering a lot of choices. While you don’t want to work with a vendor that only has one solution in their bag, such a wide variety of products can be overwhelming for the architects and designers who are specifying the product, managing budgets and working hard to satisfy their customer’s needs. We have so many options to choose from that even I can get a little carried away when talking about it and not notice the guy in the corner asleep at the table. Trust though that when you engage a storage expert from Patterson Pope that you won’t have to educate yourself on our entire breadth of product before making choices for your customer. Allow us to channel our inner restaurant server and ask the right questions so we can present a few options that will meet your customer’s needs and make you look like a hero. Linda is well known for her cooking. Whenever someone needs a recipe, she's the one to go to. Cooking (and life!) can get messy though, so staying organized the is key. Fortunately, as she often points out, there is a recipe to keep stuff in order, and she gets to put this idea into practice every day.